Take the No. 4 train (Lexington Avenue Woodlawn line) to Mosholu Parkway station. Walk north on Jerome Avenue and turn right on 208th Street. At the fork: Follow 210th Street to Bainbridge Avenue, cross the street and turn left to number 3400. D train (IND) to 205th Street Station (last stop). Street sign says 206th Street and Bainbridge. From the subway stop: Walk north on Bainbridge Avenue to number 3400. Bx10 and Bx28 buses have stops on Jerome Avenue within walking distance of the Moses Division. The MTA Bus Company offers express bus service between Manhattan and the Bronx. The express bus stops at Bainbridge Avenue and 210th Street. Call 718-330-1234 for schedules or check online at mta.info. For more complete driving directions, visit Mapquest. I-87 to Exit 13/East 233rd Street. Proceed south on Jerome for one-half mile. Road forks at Jerome and Bainbridge Avenue. Bear left onto Bainbridge Avenue and continue past Gun Hill Road. Greene Medical Arts Pavilion is on the left. Bronx River Parkway South to Exit 9/Gun Hill Road. Turn right on Gun Hill Road, then left onto Bainbridge Avenue. Greene Medical Arts Pavilion is on the left. For Moses Division Hospital, turn right onto East 210th Street for main entrance. Saw Mill River Parkway to Mosholu Parkway exit. Turn left onto Gun Hill Road (first light) and then turn right onto Bainbridge Avenue. Greene Medical Arts Pavilion is on the left. 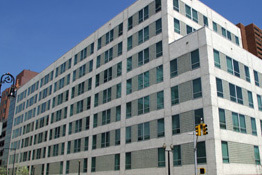 For Moses Division Hospital, turn right onto East 210th Street for main entrance. FDR Drive over Willis Avenue Bridge to I-87/Major Deegan Expressway North to Exit 13/ East 233rd Street. Make the first right on Jerome Avenue and proceed south for one-half mile. Road forks at Jerome and Bainbridge Avenues. Bear left on Bainbridge Avenue and continue past Gun Hill Road. Greene Medical Arts Pavilion is on the left. Brooklyn-Queens Expressway (BQE) / I-278 to the Robert F. Kennedy Bridge to the Bruckner Expressway/I-278 to the Bronx River Parkway North and take Exit 9/Gun Hill Road. Turn left onto E. Gun Hill Road and then turn left onto Bainbridge Avenue. Greene Medical Arts Pavilion is on the left. For Moses Division Hospital, turn right onto East 210th Street for main entrance. Whitestone Bridge to the Cross Bronx Expressway/I-95 to the Bronx River Parkway North and take Exit 9/Gun Hill Road. Turn left onto E. Gun Hill Road and then turn left onto Bainbridge Avenue. Greene Medical Arts Pavilion is on the left. Throgs Neck Bridge to the Cross Bronx Expressway/I-95 to the Bronx River Parkway North and take Exit 9/Gun Hill Road. Turn left onto E. Gun Hill Road and then turn left onto Bainbridge Avenue. Greene Medical Arts Pavilion is on the left. Robert F. Kennedy Bridge to the Bruckner Expressway/I-278 to the Bronx River Parkway North and take Exit 9/Gun Hill Road. Turn left onto E. Gun Hill Road and then turn left onto Bainbridge Avenue. Greene Medical Arts Pavilion is on the left. I-95 North/New Jersey Turnpike to George Washington Bridge lower level to I-95 North/Cross Bronx Expressway. Take Exit 1 toward Henry Hudson Parkway 9N . Follow signs for New York 9A N/Henry Hudson Pkwy/Riverside Drive. Keep left at the fork and merge onto Henry Hudson Pkwy/New York 9A N. Take Exit 24 to merge onto Mosholu Pkwy and turn left at W. Gun Hill Road. Turn right at Bainbridge Avenue. The Children's Hospital is on your right. For parking, turn left onto 210th Street and left again onto Wayne Avenue. The garage entrance will be on your left. Valet parking is also available on 210th Street in front of the main hospital entrance. Grand Central Parkway West to I-278 East /Robert F. Kennedy Bridge to I-87 North/Deegan Expressway to Exit 13/ East 233rd Street. Make the first right on Jerome Avenue and proceed south for one-half mile. Road forks at Jerome and Bainbridge Avenues. Bear left on Bainbridge Avenue and continue past Gun Hill Road. Greene Medical Arts Pavilion is on the left. Van Wyck Expressway/I-678 to the Whitestone Bridge to the Cross Bronx Expressway/I-95 to the Bronx River Parkway North and take Exit 9/Gun Hill Road. Turn left onto E. Gun Hill Road and then turn left onto Bainbridge Avenue. Greene Medical Arts Pavilion is on the left. There is on-street parking available in the Moses Division neighborhood. Check the street signs for rules and accessibility. Moses Division: Montefiore offers a convenient valet parking service for patients and visitors to ensure parking availability during busy commuting hours. Valet parking is offered 9:00 am to 5:00 pm Monday through Friday at an additional cost of $5 to the current parking garage fees at the 210th Street garage. Phone: 718-920-5691. For families of patients admitted to the hospital, ask about the special weekly discount pass for $25 plus $10 deposit.